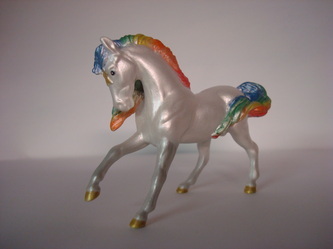 Starlite, as many of you may already know is Rainbow Brite's trusty steed. 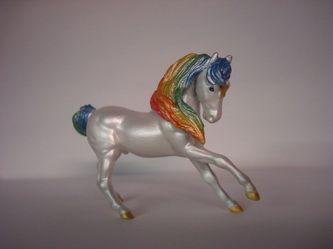 He was customized from a Breyer G2 Warmblood Stablemate. Added details and length to mane & tail & Sculpted forehead star. Painted with Pearlescent acrylics, pastels and gold watercolor. Completed 2011 (one of my very first pieces! ).